The UK’s leading garage door manufacturer, Garador, have just introduced a slick new operator to automate their range of canopy geared up and over garage doors. The aptly named, GaraMatic Canopy Operator, has been designed specifically to electrically operate Garador’s canopy garage doors. In the past, canopy bow arm conversions have tended to involve the use of a rather bulky and very intrusive lifting arm which was attached to the back of the canopy door. This would reduce the drive through height into the garage by at least 140mm and was not the most elegant device to look at either. Garador’s engineering team have been working hard over the last few years to develop a more streamlined version and are really pleased to announce the new GaraMatic Canopy operator which includes a sleek new activating arm. When in the open position, the activating arm sits behind the top edge of the garage door, enabling full opening height as well as full drive through height. Another unique feature is that the door is fully operational in manual mode. Garador have also produced a short video on their YouTube channel, showing how quickly and easily the GaraMatic Canopy Operator can be installed. 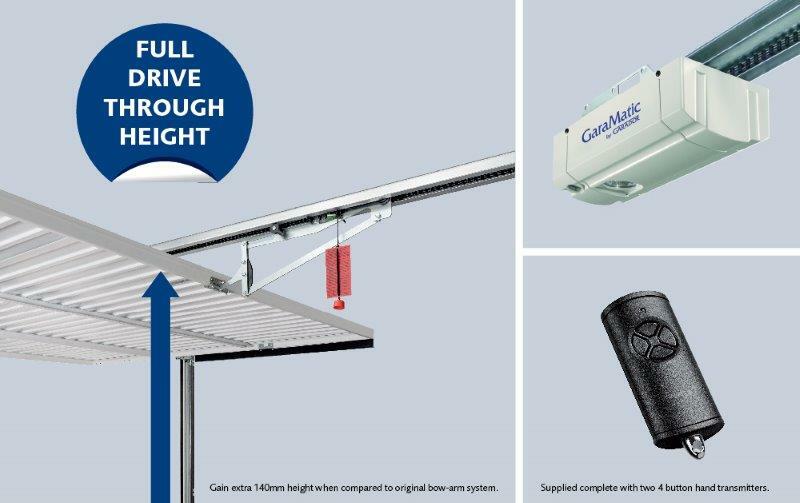 The GaraMatic Canopy operator is quick and easy to retrofit to existing canopy garage doors and is therefore expected to be a huge success, providing homeowners with a more convenient way to open their Garador canopy garage door.